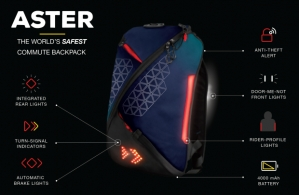 Aster claims to significantly improve visibility by implementing safety features into their backpack previously only seen in motor vehicles. It looks like a pretty cool idea. Let's see if they can get it into production and a cost that is fair.